C++ is a complex language with many subtle facets. This is especially true when it comes to object-oriented and template programming. 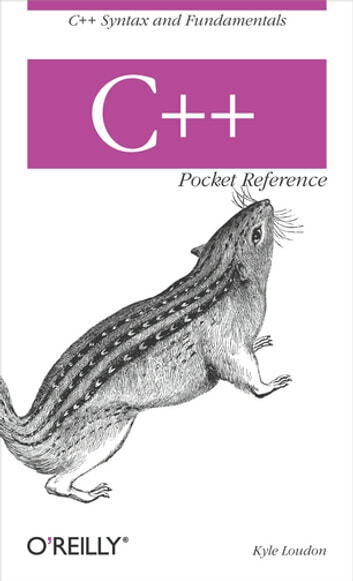 The C++ Pocket Reference is a memory aid for C++ programmers, enabling them to quickly look up usage and syntax for unfamiliar and infrequently used aspects of the language. The book's small size makes it easy to carry about, ensuring that it will always be at-hand when needed. Programmers will also appreciate the book's brevity; as much information as possible has been crammed into its small pages. C++ Pocket Reference is useful to Java and C programmers making the transition to C++, or who find themselves occasionally programming in C++. The three languages are often confusingly similar. This book enables programmers familiar with C or Java to quickly come up to speed on how a particular construct or concept is implemented in C++. Together with its companion STL Pocket Reference, the C++ Pocket Reference forms one of the most concise, easily-carried, quick-references to the C++ language available.